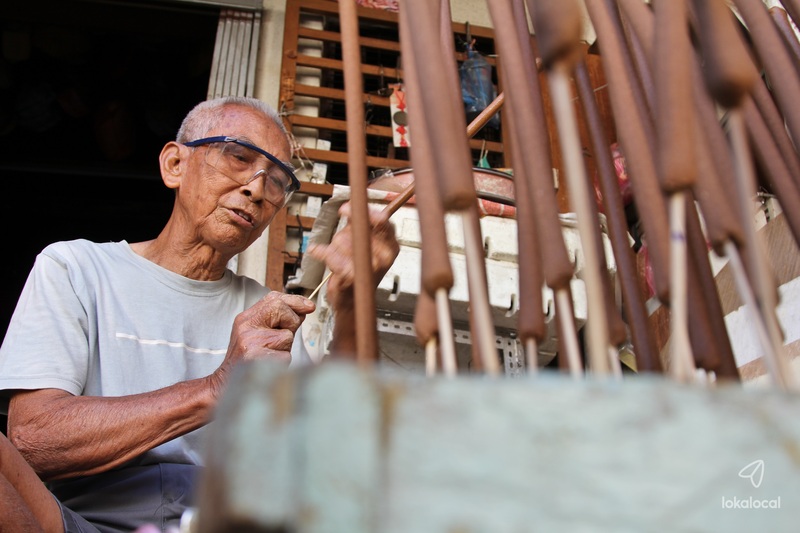 Meet Mr Lee, a joss stick maker, and learn about this traditional trade and living heritage in Penang. Commonly used for religious and ritual purposes, joss sticks are made from a variety of aromatic materials which release a pleasant-smelling smoke when burned. Born in 1928, Mr Lee has been making joss sticks for over 70 years. His father used to make joss sticks as well, so he took up this family business at age 12, before learning to make his own joss sticks by observing masters from China. While he does not rely on this trade to earn a living anymore, he is always eager to exhibit his skills to guests and keep the tradition alive. With his love for his wife burning as passionately as his love for the trade, he had promised his late wife to continue making and giving his joss sticks to others as blessings. From the Weld Quay Ferry & Bus Terminal, cross Pengkalan Weld using the pedestrian bridge. Then turn right and walk along Pengkalan Weld until you reach Gat Lebuh China, with the Malayan Railway Building in front of you. Turn left into Gat Lebuh China and walk the distance. At the junction of Lebuh Pantai, Gat Lebuh China becomes Lebuh China. Continue along Lebuh China and you will see the Kuan Yin Teng right in front of you. Our shophouse is located behind the temple. Mr Lee will demonstrate his skills and share his knowledge on the trade that he was involved since 1953. You will also learn how to mix the powders into a paste, knead, roll onto bamboo sticks and bake in the sun. Types of joss stick include 10 inches joss stick, 6 inches joss stick,, 22 inches joss stick and cones. Certificate of Participation will be given upon completion of the course. He will also write your name in calligraphy and give out his joss sticks and corns to you. It’s a promise he made to his wife so they can use it for blessings, to give them good, happy and long lives. Joss sticks being baked in the sun. Its an amazing experience being mentored by Mr. Lee on making joss sticks on my own. These experiences only come once in a lifetime. It also shows us how skillfull these veterans are in their trade and how much passion they have for their trade. Its a treat to be able to quiet down and just focus on making joss sticks after days of hustle and bustle. Its an educational, challenging yet relaxing and fun experience. You'd never want to miss out! Paste - A mixture of sandalwood and Teja powder.